Organic liver from venison reared on West Country farms, prepared in the Riverford butchery. Once regarded as the hunter’s or gamekeeper’s perk, venison liver is now a must-have ingredient in many top restaurants thanks to its sublime texture and flavour. It’s also really easy to cook – a couple of mins on each side in a pan. 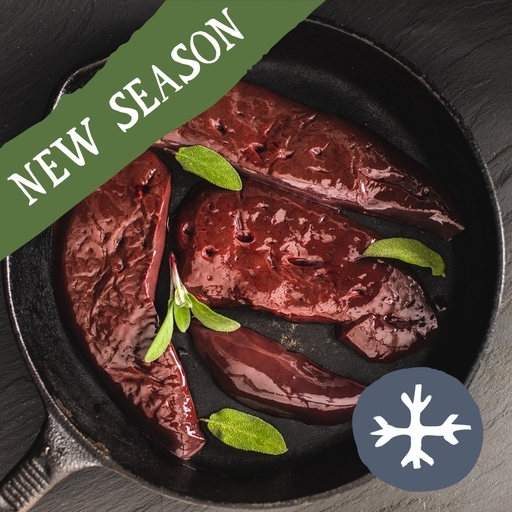 Our venison has a short season - we think that it will be available to buy until about the 9th of November depending on how fast it sells. Previously frozen. Defrost thoroughly before cooking. Dust with seasoned flour. Heat a knob of butter and a splash of oil in a pan. Fry the liver for 2 mins each side for medium-rare, 3 mins for more well-done meat. Or chop into ribbons and stir-fry for 1 min. Good with onion gravy, mash and seasonal greens.